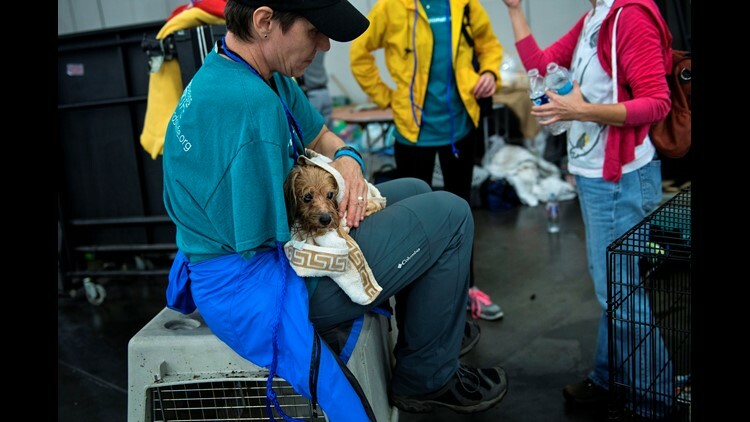 A vet holds a dog in the George R. Brown Convention Center after Hurricane Harvey on August 28, 2017 in Houston, Texas. Finding Rover, Petco, and the Houston SPCA are using facial recognition to reunite Harvey victims with their pets. In the aftermath of Hurricane Harvey, many pet owners have been separated from their animals. More than one million people and their animals in the Houston area have been displaced because of the storm. Finding Rover, Petco Foundation, and Houston SPCA are teaming up to provide Harvey victims with a database they can use to find their lost pets. Photos of animals that arrive at shelters will be automatically loaded into a database. Pet owners can search through all participating shelters for lost or found animals by uploading a photo of the pet to www.findingrover.com. The database continuously searches for matches and will provide possible matches as well as a location for your pet. The website is accessible through desktop computers or through a free mobile app, and is free to use. In addition to using the database, pet owners are encouraged to search through local shelters' websites, and register pets with microchips as soon as possible. "A dog or cat is a beloved family member, and if he or she goes missing, it can be devastating to everyone involved, especially in times of disasters," said John Polimeno, CEO and founder of Finding Rover. "We want to do everything we can to safeguard our dogs and cats from being lost forever."